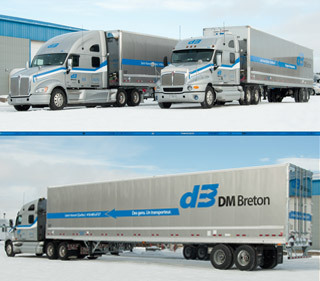 DM Breton is a motor carrier specializing in the transport of your freight, lumber and paper products since 1984. Covering both Canada and USA, our drivers’ experience is your guarantee of complete satisfaction for the transportation of your goods. At the cutting edge of the industry, our state-of-the-art fleet of trucks is equipped with computer systems and satellite communication. DM Breton’s expertise and drive is your guarantee of unrivalled service! To provide you with reliable road transportation, DM Breton relies on highly advanced technologies. You can trust the expertise of our committed team for trouble-free transport service across the North American road network. For safe and sound delivery of your goods, the place to go with confidence, DM Breton!